Apple Owes Ireland $14.5 Billion In Taxes, European Commission Says : The Two-Way The EU competition commissioner says Ireland gave the tech giant tax breaks that are illegal under European law. Now Ireland must recover that money, with interest, the commissioner says. European Union Competition Commissioner Margrethe Vestager speaks during a media conference at EU headquarters in Brussels on Tuesday. The European Union says Ireland has given illegal tax benefits to Apple Inc. and must now recover the unpaid back taxes from the U.S. technology company, plus interest. The European Union's executive branch has found that Ireland granted unfair and illegal tax breaks to the tech giant Apple, and ruled that Apple now owes more than $14.5 billion in back taxes. The commissioner in charge of competition policy, Margrethe Vestager, says that under EU rules, "Member states cannot give tax benefits to selected companies." But the European Commission found that Ireland allowed Apple — which has two companies incorporated in Ireland, Apple Sales International and Apple Operations Europe — to pay far less in taxes than other companies did. On top of that, the commission says, Apple chose to record all sales in the EU as sales in Ireland, allowing that low rate to apply to all sales in the entire EU single market. In 2003, Apple paid Ireland an effective tax rate of 1 percent on European profits, the commission says. By 2014, that had dropped to 0.005 percent. The country's corporate tax rate, in general, is 12.5 percent, Reuters reports. The EU says the illegal tax breaks began in 1991. But it can order recovery only of "illegal state aid" — which is what the EU considers those tax breaks to be — from 2003 to 2014. 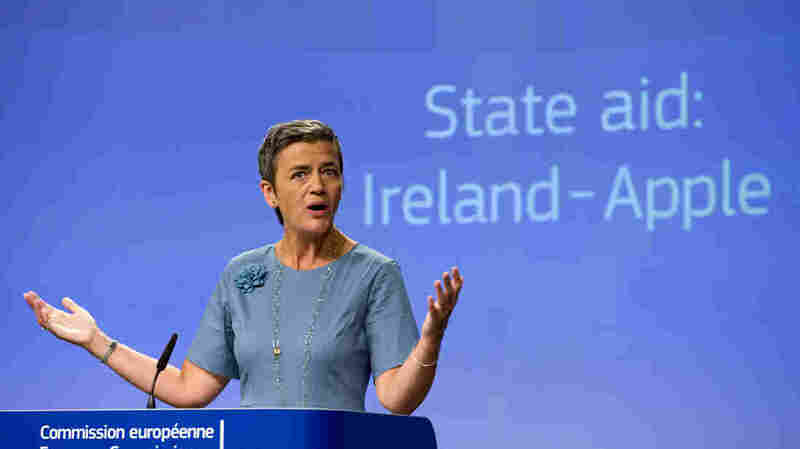 The commission says Ireland must now collect 13 billion euros (some $14.5 billion), plus interest, from Apple. The final tax bill could be lower if Apple decides to pay taxes to other countries, or funnel more of its profit to its U.S. companies. Ireland's finance minister, Michael Noonan, says in a statement that he "profoundly" disagrees with the decision and plans to appeal. Apple also promises an appeal. Reuters reports that in a statement, the company describes the ruling as "an effort to rewrite Apple's history in Europe, ignore Ireland's tax laws and upend the international tax system in the process." The tech giant says the decision "will have a profound and harmful effect on investment and job creation in Europe." Apple is not the only business facing a hefty tax bill after EU regulators scrutinized member country policies. Starbucks has been ordered to pay up to 30 million euros ($33.5 million) to the Netherlands, and McDonald's and Amazon are both waiting for decisions about deals they struck with Luxembourg.